Last week, I had the pleasure of welcoming two travel bloggers (Helene from Helene in Between and Andrea from VoloGratis.org) to my home city of Liverpool. 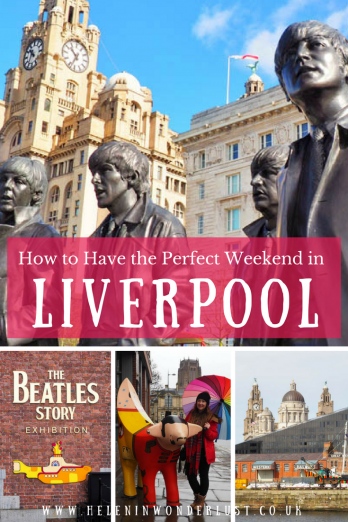 My task was to create an itinerary and show them all the best things to do in Liverpool. Liverpool is an incredible city known for its music, maritime heritage, football, resilient and friendly people, a great sense of humour, beautiful buildings and vibrant night life. It’s also very affordable too. If Liverpool isn’t on your radar, it really should be! Liverpool has always been a quirky and gritty city, filled with interesting and creative people, but over the last 30 years or so, Liverpool has really come alive again and I was eager to show my new friends what we’re made of up north. What surprised me was just how emotional an experience it was and made me fall in love with the city all over again. Everyone was so welcoming and I had so much fun talking about Liverpool, playing tour guide and just enjoying my own city as a tourist – something I don’t usually do. 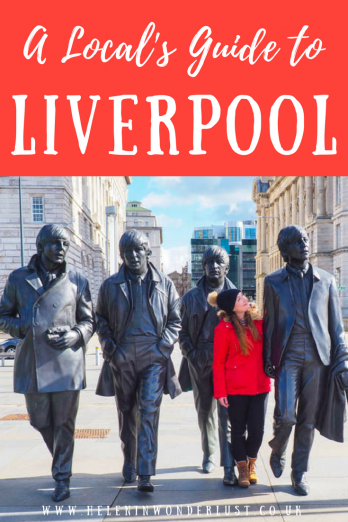 So I wanted to share my Liverpool city guide with you too, so you can plan your own trip to this fabulous city – whether you’re a tourist or a local! The below should give you a pretty good idea of how to spend 2 or maybe even 3 days in the city. You may not get to do everything, but it’s a start! 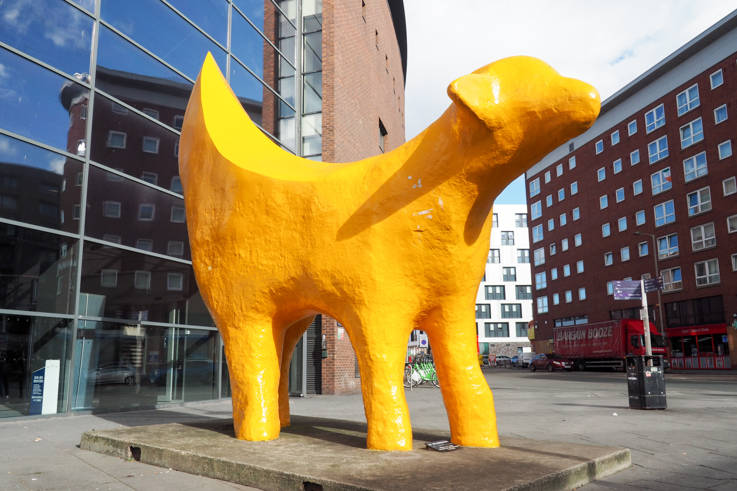 It’s a bit out of the way, but if you get chance, walk up to the corner or Tithebarn Street and Vauxhall Road to see our most famous sculpture, the Superlambanana. The sculpture comments on the dangers of genetic engineering, represents sheep and bananas which were common cargo through the port and I’d like to think it also gives a nod to the famous Liverpool sense of humour. When it was first unveiled, it was a little controversial, however these days it’s a local treasure. As with most works of art, take from it what you will. Keep your eyes peeled and you’ll see a few smaller, decorated replicas dotted around the city too! Even if you’re not a fan of modern art, they’re kind of cute. 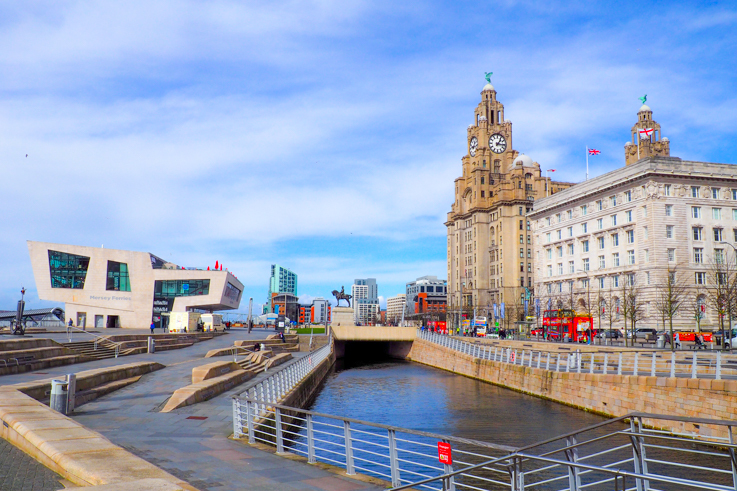 Walking straight down Tithebarn Street and then Chapel Street, you’ll reach the waterfront at the Pier Head. 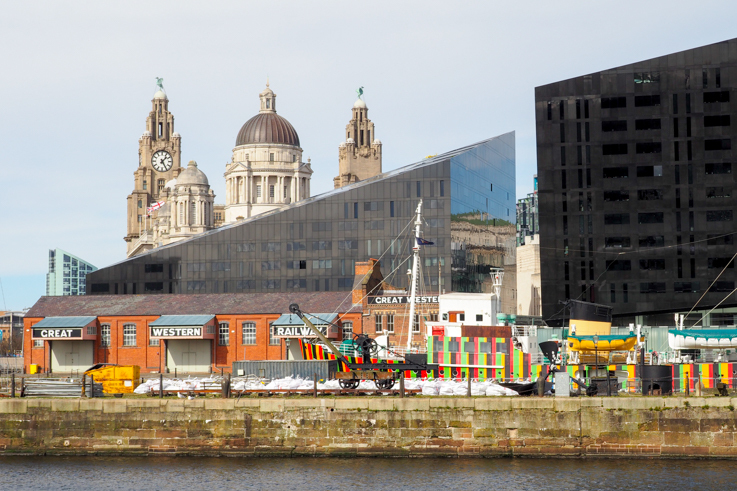 Here you’ll see the most iconic buildings in the city, the Three Graces – the Royal Liver Building, the Cunard Building and the Port of Liverpool Building. 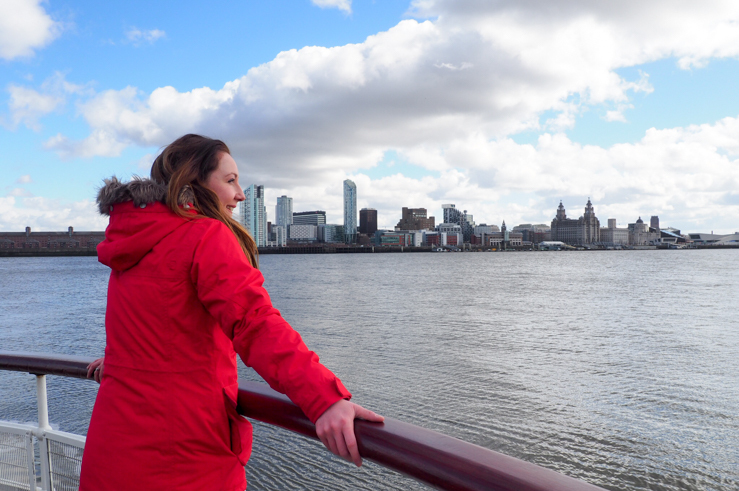 The Liverpool skyline is probably one of the most recognisable and beautiful skylines in the world and there’s no better place to view it than from a ‘Ferry ‘Cross the Mersey’, so I was really keen to take my visitors out on the water to see if for themselves! They also play the famous song by Gerry and the Pacemakers at various points during the journey which is fun! The ferry leaves from the Pier Head, stopping at the Seacombe and Woodside terminals ‘over the water’, so you can get off and explore the Wirral too. In the Summer months, you can even take a cruise all the way to Manchester down the Manchester Ship Canal, which I think would be a really fun day out! 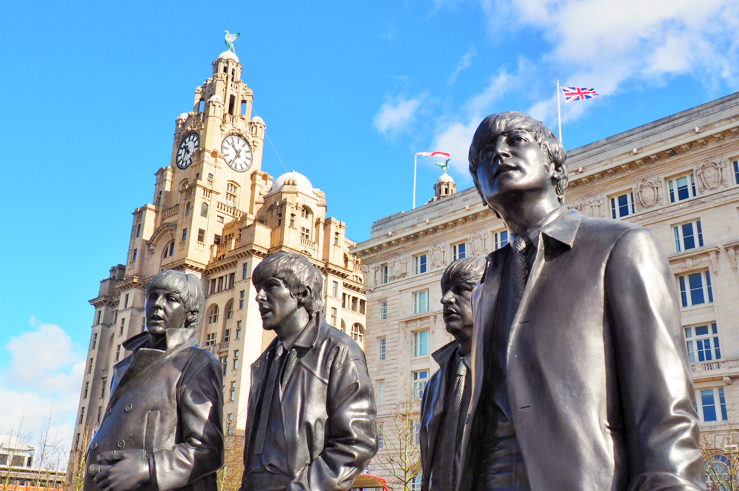 Right by the ferry terminal, you’ll fins the Pier head section of The Beatles Story where you can see The British Invasion exhibition, the Hidden Gallery and the Fab4 Cafe/Store. 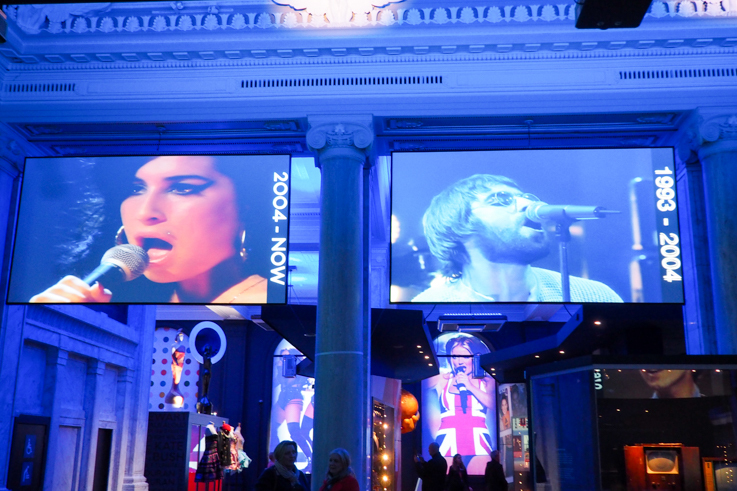 One of my favourite activities we did, was the British Music Experience (BME), which has recently opened in the Cunard Building. Music is such a big part of the culture in the UK and a big part of my life, but seeing and hearing so much of it together in one place is an incredible, nostalgic and uplifting experience. 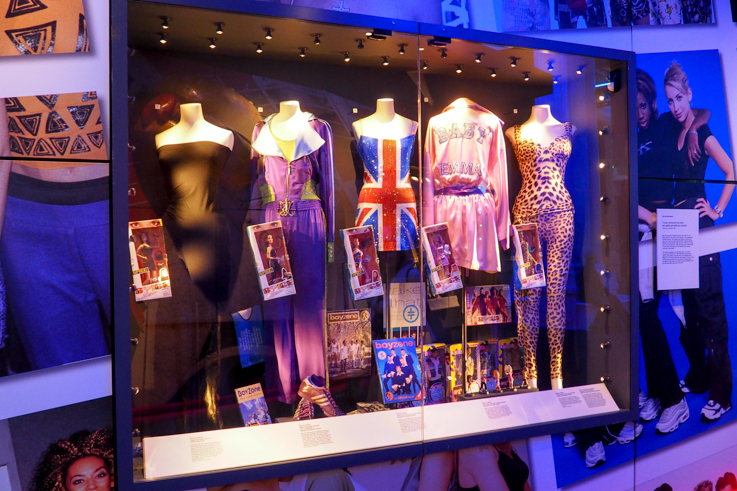 You walk through the interactive exhibition, listening to info about each era, seeing the stage costumes of the likes of David Bowie and the Spice Girls, and of course you also get to hear a lot of amazing songs along the way! It was Dusty Springfield singing ‘You Don’t Have To Say You Love Me’ that got me all teary. Once you’re done, go and hang out with my mates, John, Paul George and Ringo. They were in this band called The Beatles – you may have heard of them. 😉 The statue is cool for a quick photo stop. You’ll find them between the Three Graces and the ferry terminal. 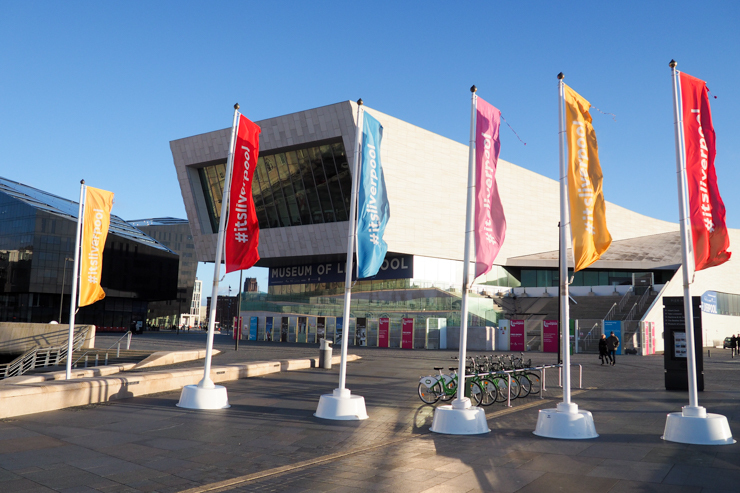 Then last but not least, is the Museum of Liverpool where you can find out all about the history of the city. Next on your tour of Liverpool should be The Albert Dock, which is short walk down the seafront. 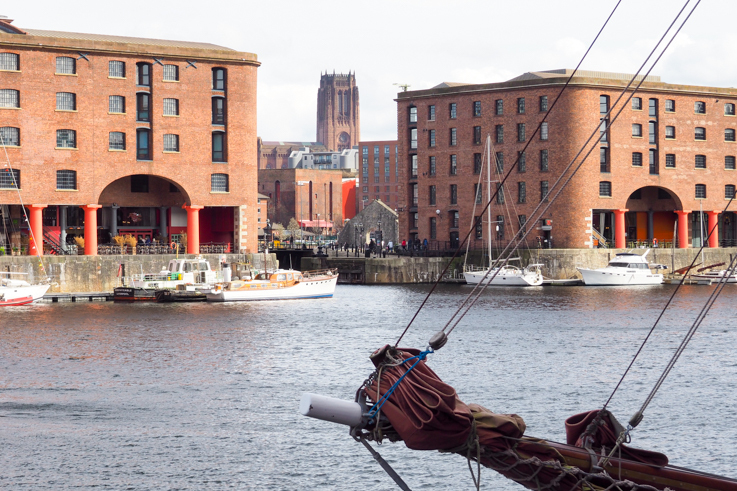 The dock itself is a beautiful place to spend an afternoon, with lovely bars and restaurants, as well as a few of Liverpool’s best museums and galleries. 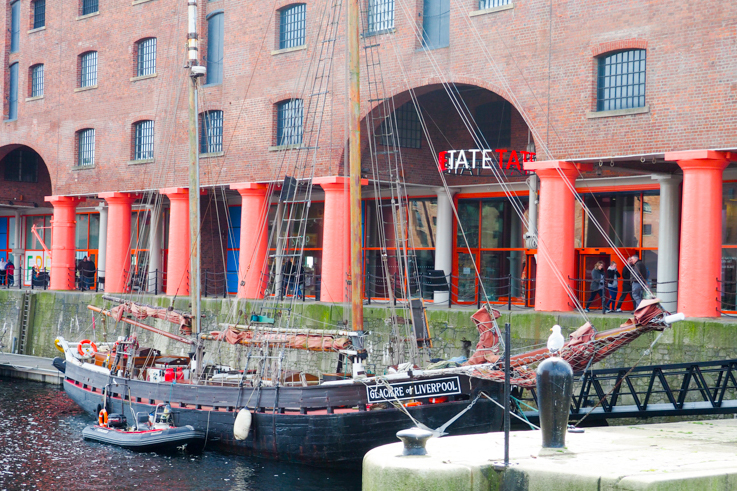 If you love modern art, you’ll love the Tate Liverpool, which is free to enter! 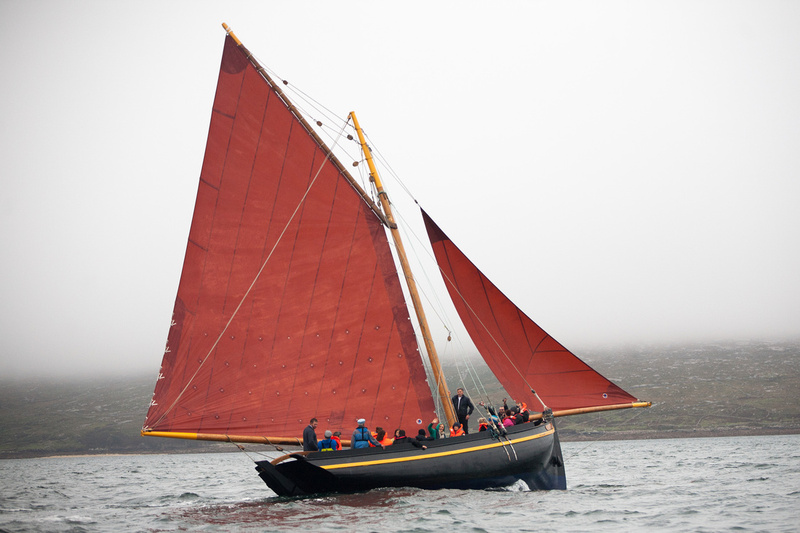 Here you’ll also find the Merseyside Maritime Museum where you can take a peek into Liverpool’s seafaring past. Important words. With modern slavery still as rife (if more underground than back then), it’s important to acknowledge the past to try and shape the future. 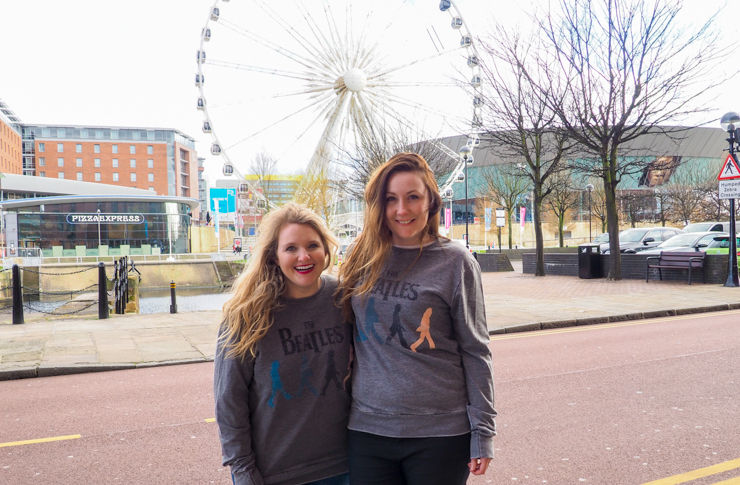 We headed to the other side of the Albert Dock, to The Beatles Story. Similar to the BME, it was a lot of fun to walk around and made me feel really proud of our musical heritage. I loved learning about the roots of the band and their humble beginnings and of skiffle music, when they were The Quarrymen, of the Casbah Coffee Club and The Cavern, the Hamburg days, their relationship with Brian Epstein days, the craziness at the height of their fame and all the way through to when John was shot in 1980 and beyond. It was really interesting. I don’t know what was wrong with me, but in the very last room, dedicated to John Lennon, I got all teary AGAIN, listening to Imagine. The words to that song feel more relevant today than ever. Before we left, we hit the gift shop with Helene and I buying matching sweaters. From The Albert Dock, it’s an easy walk to Liverpool One, a stylish shopping, restaurant and entertainment centre. There’s often events running and it’s also a great place to people watch! Liverpool One has all of the major shops, so if you are a shopper, you’ll be in heaven! 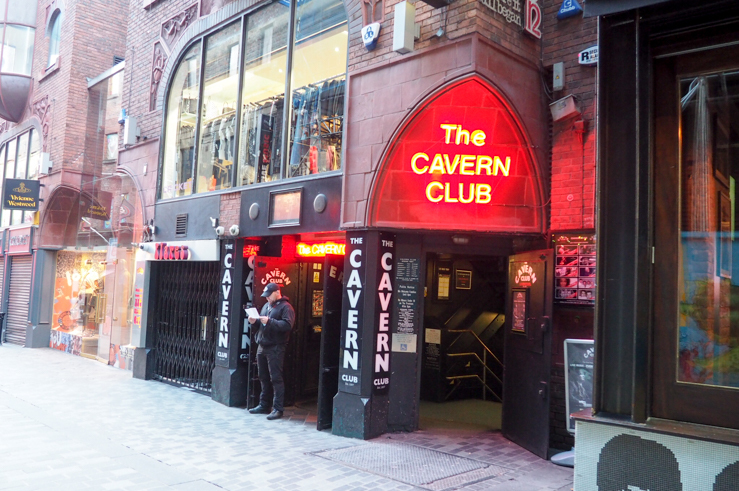 Next we headed to Mathew Street and the Cavern Club, famous as the birthplace of the Beatles. 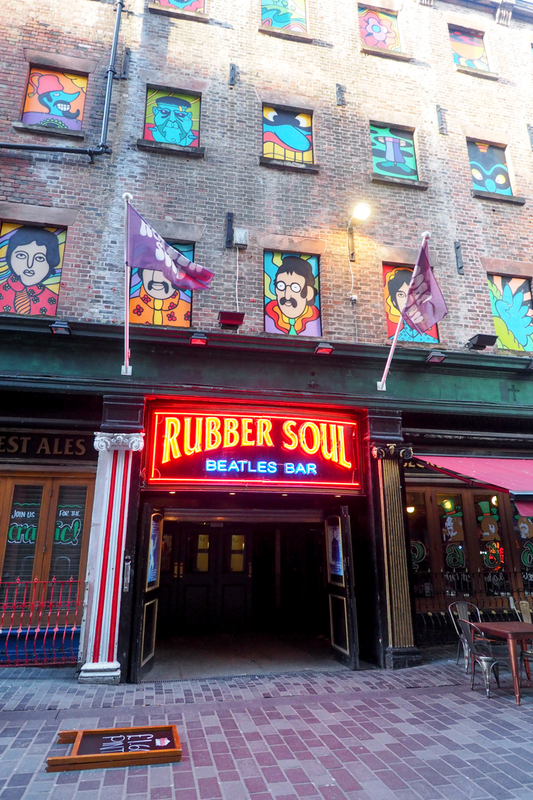 Here you’ll see the John Lennon and Cilla Black statues and various Beatles themed bars, like the Rubber Soul. 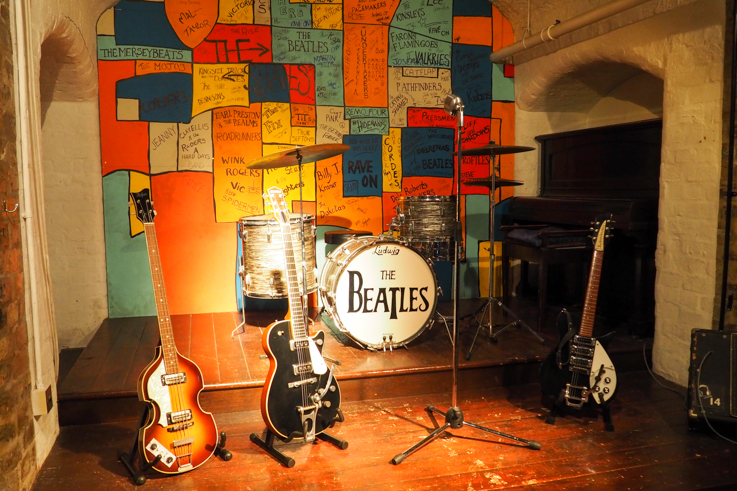 You can still hear live music at The Cavern every day and arrange Beatles tours from here. My friend Amanda went on the Magical Mystery Tour when she was in the city and visited their childhood homes. The Cavern holds a special place in the heart of many Liverpudlians and it was said that in the 60’s and 70’s you could always tell if someone had been the Cavern by the smell they had when they came out! The original Cavern was knocked down to make way for the underground railway, but was rebuilt in the exact same place, using the original plans and some of the same bricks. Thankfully it smells a lot better today! The street is always buzzing and full of interesting characters, especially on a Saturday, when it can become pretty rowdy with locals, tourists, stag and hen do’s, partying both day and night. 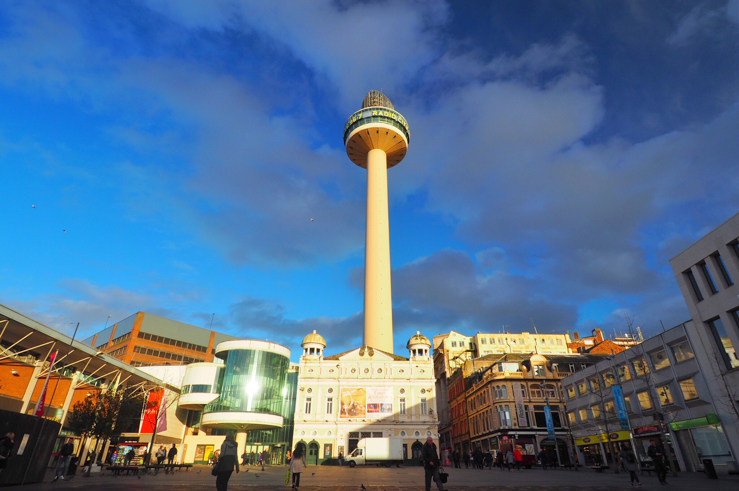 A ten minute walk away from Mathew Street, around Lime Street and William Brown Street, you will find what is known as the Cultural Quarter or The St George’s Quarter. As soon as you walk out of the front entrance of Lime Street Station, the beauty of Liverpool pretty much hits you in the face (in a nice way). 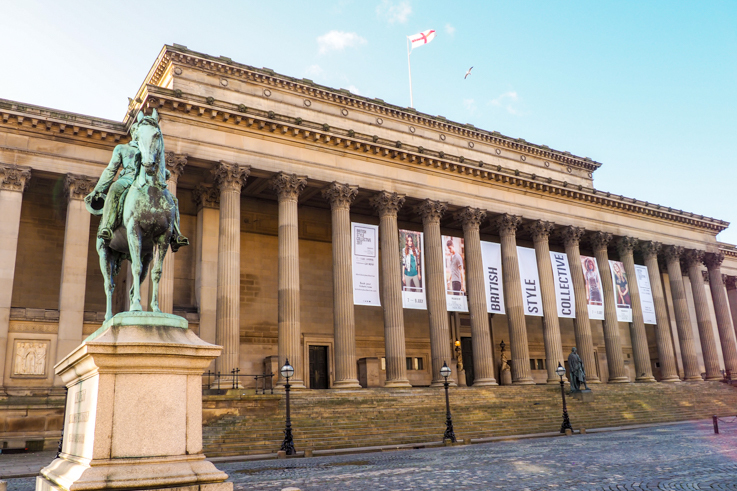 Head first to St George’s Hall which hosts various exhibitions and events throughout the year. Walking around the front of the building, you’ll see the Empire Theatre to your right, which is where you’ll find all the big touring stage shows, like The Lion King or Blood Brothers. Straight in front of you and to the left, you’ll see the Wellington’s Column, and the Walker Art Gallery, a free art gallery which, I’d say is one of the best in the UK. To the left of it is Liverpool Central Library, which is a brilliant mix of old and new, and you have to go in and see the Picton Reading room. Then to the left of that is the World Museum. All are free to enter but you may need to pay for certain exhibitions. From here walk towards Williamson Square and you’ll pass the Royal Court Theatre and the Liverpool Playhouse and the St John’s Beacon, also known as the Radio City Tower. 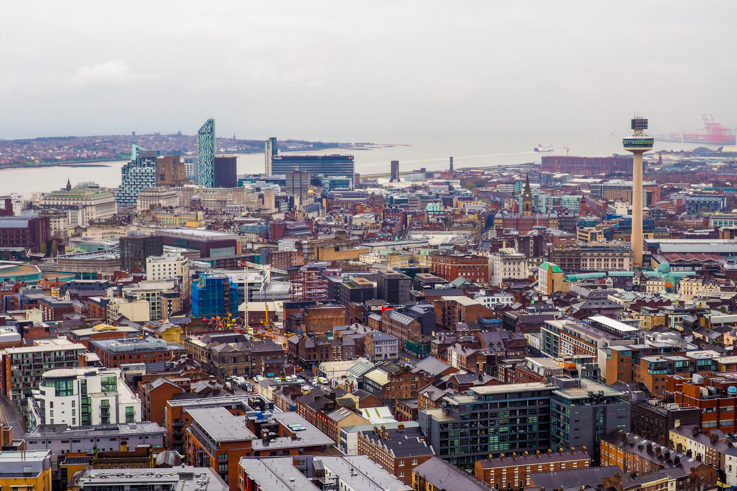 You can also go up to the viewing gallery and get a 360˚ view of Liverpool. Open daily from 10am – 5pm. From Williamson Square, we cut through to Church Street (which used to be our main shopping street before Liverpool One came along), to The Bluecoat, a stunning Grade I listed building that is a hub for the arts where you can go inside and see what’s happening or maybe grab a coffee. 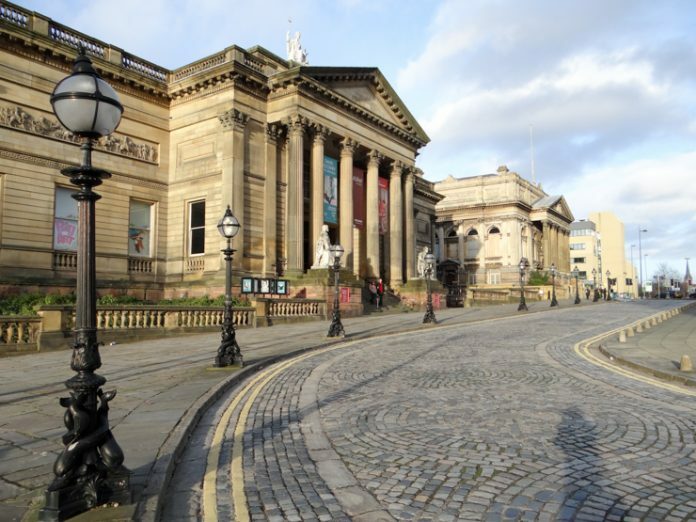 From The Bluecoat, you can walk towards Hanover Street and then Bold Street. Within the few blocks formed by Bold Street, Berry Street, Duke Street and Hanover Street (and the streets inside here like Seel Street, Slater Street and Wood Street), you’ll find most of Liverpool’s best bars, cafe’s and restaurants. 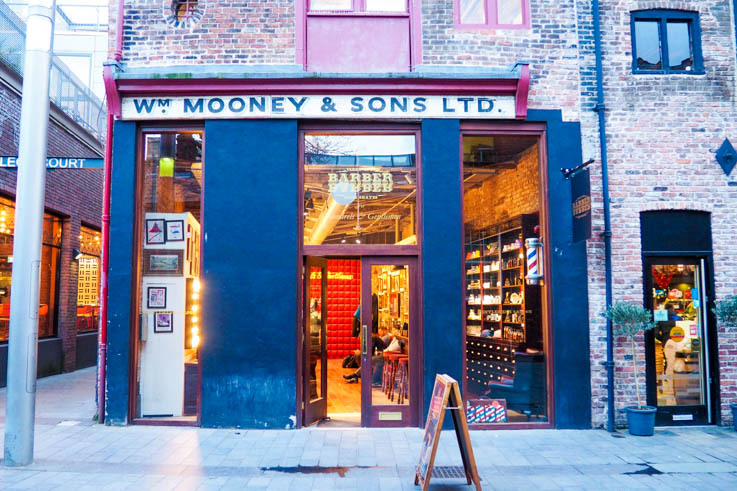 Bold street is also home to some of the best independent shops in the city, including everyone’s favourite – Utility. At the far end of Street, you’ll see St Luke’s or as we call it, the ‘Bombed Out’ church. It was heavily bombed during WWII and the inside was destroyed, however the outer shell remained completely intact – you can see right through it. These days it’s used for exhibitions and events. It’s being renovated at the moment, but is a very cool space to visit when it’s open! Around here you’ll also find FACT, the Foundation for Art and Creative Technology. 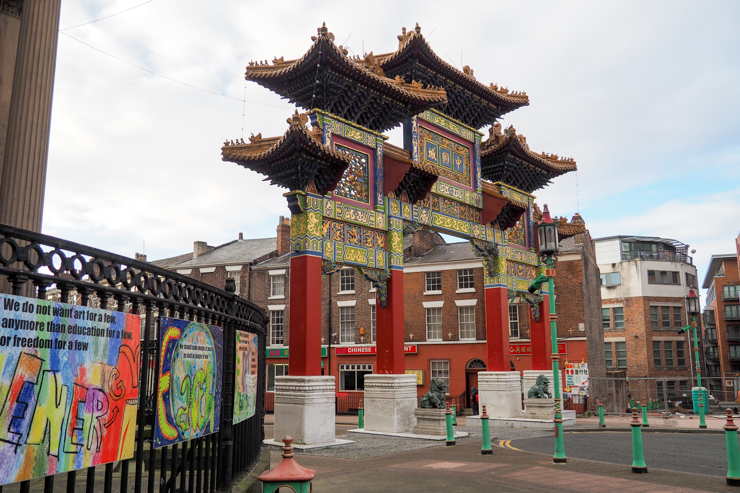 Not far from St Luke’s is Liverpool’s Chinatown. Liverpool has the oldest Chinese community in Europe. At the edge of Chinatown you’ll spot the stunning Chinese Arch, which is the tallest in Europe. Here you’ll find no shortage of Chinese restaurants and supermarkets and this is the place to be during Chinese New year! A few minutes walk away from Chinatown, is Hope Street, one of my favourite places in the city. My mum went to school here (at Blackburne House), as did my uncle and grandad (to Liverpool Institute across the road – the same school as Paul McCartney and George Harrison), John Lennon (and my dad) attended Liverpool College of Art, just off it is the Unity Theatre where I used to perform in my acting days – it’s quite a special place to my family and the rest of the city in general. At the southern end of the street, you’ll find Liverpool Cathedral, which was designed by Sir Giles Gilbert Scott, who also designed the famous British red telephone box and if you look, you’ll find his smallest creation inside his biggest creation. It’s free to enter the cathedral, but the one thing I really suggest that you do, is to pay £5.50, to go up the Vestey Tower, to see amazing 360˚ views of the city. 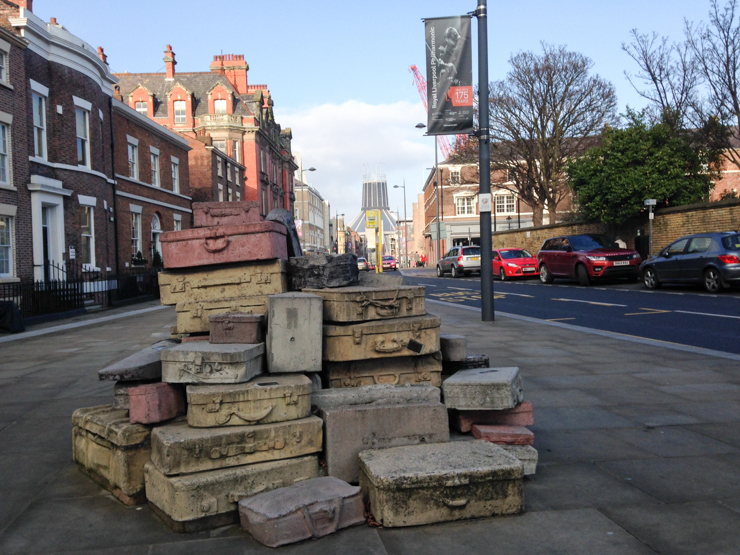 Upon leaving the cathedral, walk up Hope Street, where you’ll see the Liverpool Institute of Performing Arts (once Liverpool Institute and Liverpool College of Art) and the suitcases sculpture called ‘A Case History’. You’ll also find some of the best restaurants in the city! 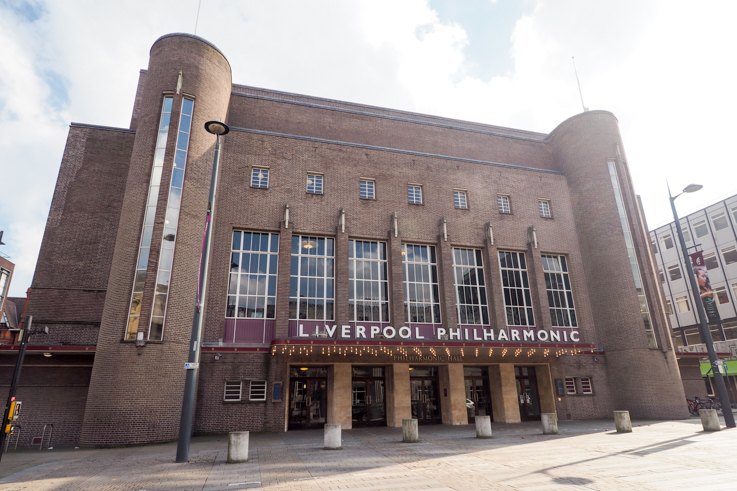 Cross over the road and keep walking north and you’ll see the Liverpool Philharmonic, home to the UK’s oldest continuing professional symphony orchestra. Continue on and you’ll come to the Everyman Theatre, my favourite theatre in the city. If you’re here over the festive period, definitely try to see the annual Rock n’ Roll panto. It’s one of my favourite things to do, is always hilarious and the actors are also the band – it’s really cool. 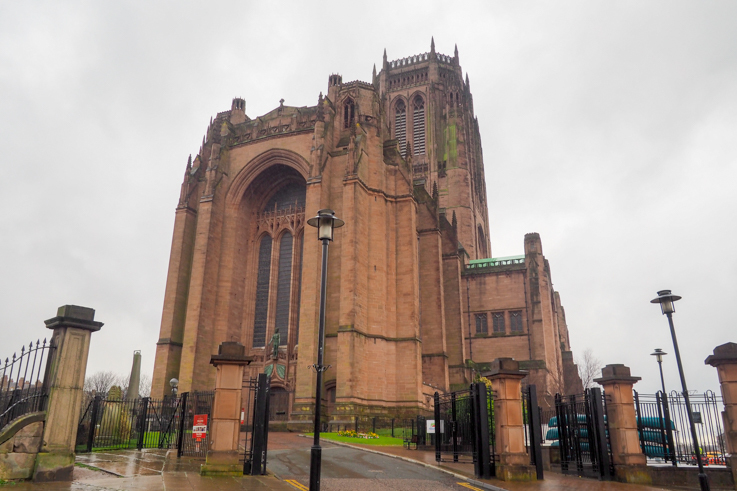 At the northern end of Hope Street, you’ll find Liverpool’s other cathedral – yes we have two! And they couldn’t be more different, even though they were only built a few years apart! 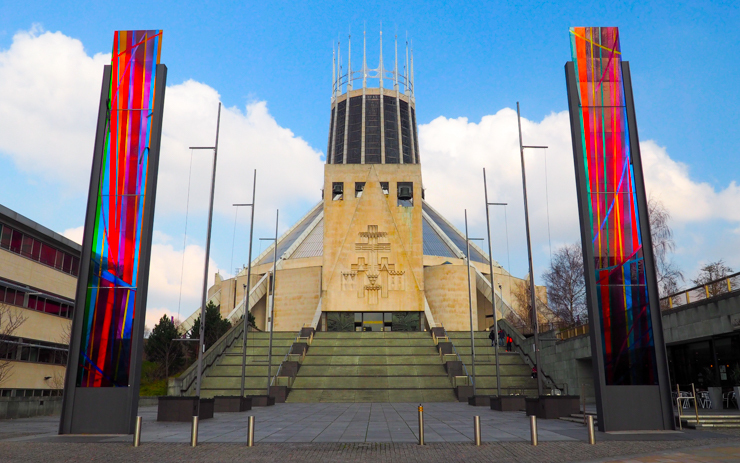 Liverpool Metropolitan Cathedral is the Catholic cathedral, affectionately known as Paddy’s Wig Wam, as it was built primarily for the large Irish community in Liverpool and due to its shape. Turn around and come back down Hope Street and stop at the Philharmonic Dining Rooms (known locally as ‘The Phil’) for a well-earned drink at this quirky and traditional pub. And be sure to pop your head into the famous men’s loos (ladies – just check there’s no-one peeing first). 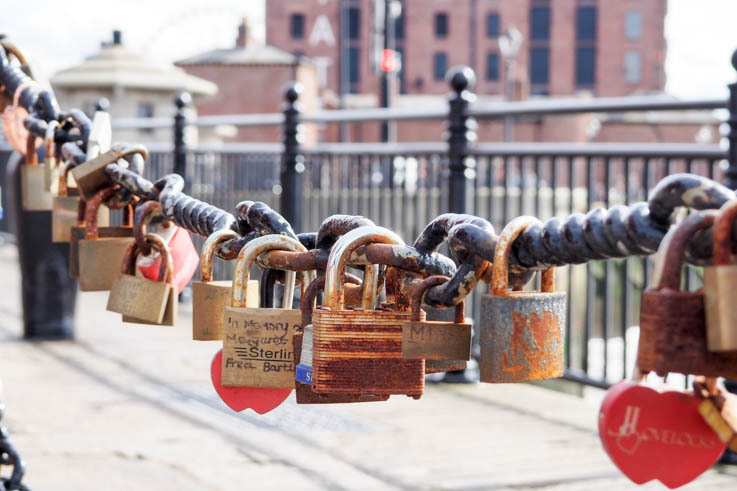 Slightly out of the city centre (15 – 20 minutes walk from Liverpool One or Hope street) , you’ll find Liverpool’s coolest neighbourhood – The Baltic Triangle. Once just a load of derelict warehouses, this is now THE place to be and the heart of Liverpool’s creative industry. The area is kind of scruffy and industrial looking, but don’t let that fool you – there are amazing treasures within! Probably the best of these is Camp & Furnace. Part bar, part restaurant, part creative space, part music venue, part event space – definitely one of the coolest restaurants in the UK! They have an amazing events programme which I suggest you keep your eye on! Liverpool has more parks than Paris, don’t you know and Sefton Park in the south of the city, is one of the prettiest, with a beautiful Palm House in the middle that holds all kind of events from weddings to a silent yoga disco – whatever that may be. The park is where they hold the Africa Oye festival each June and the Liverpool Food and Drink Festival in April and September. Another great place to visit just outside the city centre is Lark Lane, next to Sefton park. It’s a cute street filled with great bars, cafes and shops. I had one of my favourite breakfasts (ever) at Tea House there – it was the avocado and crispy bacon on toast in case you want to order it too! 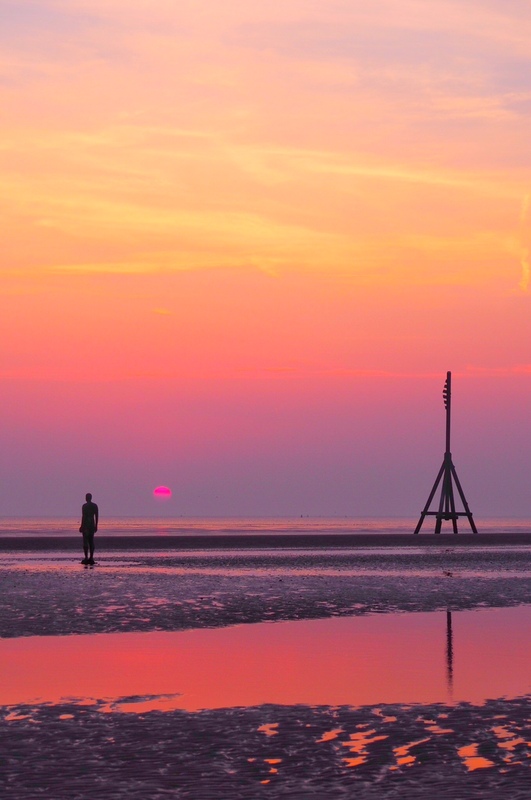 Then if you head north, to Crosby Beach, you’ll find Antony Gormley’s ‘Another Place’, a hauntingly beautiful art installation, made up of 100 statues, known locally as the ‘Iron Men’. I don’t know how, but being here always makes me feel a bit sad and also hopeful at the same time. And if you’re a footie fan, Everton and Liverpool football clubs are both very close to the city centre. Liverpool football club is based in Anfield and Everton is just across Stanley Park in Walton (although a new stadium has recently been announced at Bramley Moore Dock). Top Tip: Antony Gormley’s ‘Another Place’ is a beautiful place to be at sunset (when the sun is actually shining that is). There’s always something going on in Liverpool and to find out the best info and listings, keep an eye on the fabulous Independent Liverpool blog or Facebook page! This is always my go to to find out what cool stuff is happening in the city. They also run events and you can buy an Independent Liverpool Card which gets you tons of discounts in the city! Liverpool has no shortage of cool hotels for you to stay in, but we stayed in the absolutely gorgeous Hope Street Hotel, in Liverpool’s Georgian Quarter. Whilst the outside of the building is more traditional, the inside is simplistic, contemporary and elegant in design and was Liverpool’s first boutique hotel. It’s also just a stones throw away from the Everyman Theatre and the Liverpool Philharmonic, in between both of Liverpool’s cathedrals and surrounded by many of the best restaurants in the city. The hotel is a 15 – 20 minute walk from Liverpool’s Lime Street Station, or a short cab ride away. Top Tip: The Hope Street Hotel also known for being a bit of a celebrity hot spot and has hosted the likes of Yoko Ono, Kanye West, Lady Gaga and Meryl Streep. I may or may not have said “hello” to a very striking man (who was stood next to me as I was checking out), thinking it was someone I knew, until a split second later I realised it wasn’t someone I knew at all, but a very famous Academy Award winning actor (who shall remain nameless). He said hello back and smiled at me, in case you were wondering. 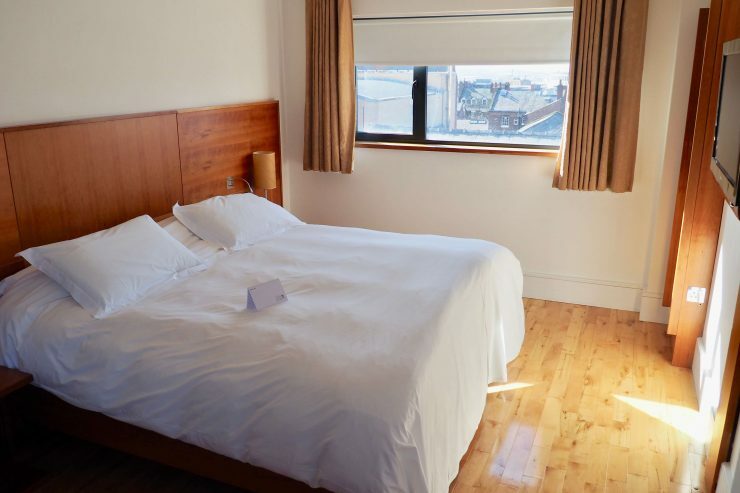 Book your stay at the Hope Street Hotel here. 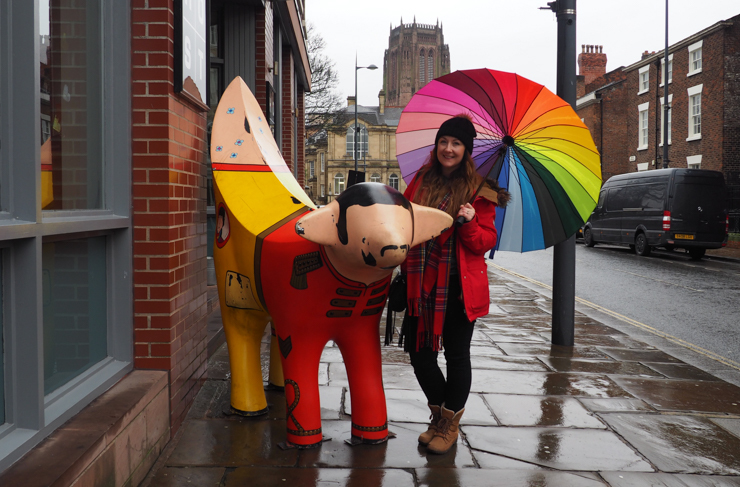 As we had almost 2 days and were staying at the Hope Street Hotel, so I planned our route so that we could pretty much walk everywhere – as Liverpool city centre is quite small, it’s a really walkable city. You can easily adjust the route depending on where you are staying! 2 – 3 days would be a good amount of time to spend in the city to really get a feel for the place and visit a few of the attractions and do some of the activities. To give you an idea of the route, here’s a little map of the places I mention above. With all that walking, you’re going to need some good food to keep you going and there’s absolutely no shortage of good food in Liverpool! From cute cafés, fish & chip shops, to upmarket restaurants, Liverpool has a bit of something for everyone. On our first night, we had an exquisite dinner at The London Carriage Works. The meal was beautifully presented, tasty and the house wine (yes I tried both the red and white) was absolutely lovely. On our second night, I took Andrea and Helene to The Pen Factory, a cool, laid back bistro, where we had a really simple yet amazing dinner. Helen and I shared the veggie tapas board and and a baked Camembert. Which is pretty much my idea of food heaven! If you get the chance, you need to try our local dish scouse, which is short for lobscouse, a stew that was often eaten by sailors in Northern Europe. The recipe varies, but is generally made from meat (usually lamb or beef or both), stock, vegetables (onion, potatoes and carrots) and comes with bread on the side and often red cabbage on top. Good places to try are The Clove Hitch, Maggie May’s and The Baltic Fleet (also a micro brewery with local ales). Other favourite restaurants of mine in the city include Fonseca’s on Stanley Street, Mowgli Street Food on Bold Street, Free State Kitchen on Maryland Street and The Art School on Hope Street. For lunch, there was only one thing for it – fish & chips from a local chippy. I like my fish & chips from The Lobster Pot (there’s one on Ranelagh Street by central station and the other is on Whitechapel near Mathew Street) – they’re cheap, cheerful and tasty. My friend PK also highly recommends Johnny English on Bold Street, which is really cute. If you fancy posh fish & chips at a restaurant, I recommend you try one of the gastro pubs, like The Old Blind School or The Monro. For a good cuppa, try Bold Street Coffee or Leaf (also on Bold Street). If you’re there on a Sunday, head to Camp & Furnace for the best Sunday roast in Liverpool (actually everyone know that their mum makes the best roast dinner, right?) 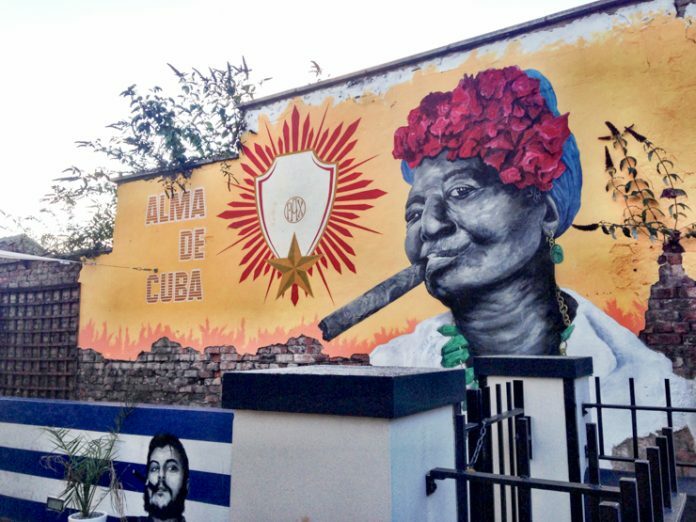 or maybe try the Gospel Sunday brunch at Alma de Cuba – if you’re hungry enough you could do both! If you want to be very British, my favourite place for Afternoon Tea is Cuthbert’s on Mount Pleasant. Last time I was here was in December, and the ladies on the next table to us started singing White Christmas oh so softly, and one by one, each table joined in and soon everyone was singing together. It was one of the most magical moments of my life. For the best view, go to Goodness Gracious, a secret rooftop garden on top of Oh Me Oh My in West Africa House, near to the Pier Head. It’s open Monday – Friday, from 12pm – 4pm in the summer months. Top Tip: In the last few days, it’s been announced that the guys behind Independent Liverpool are going to be opening the city’s first, permanent food market called Baltic Market in the old Cains Brewery in the Baltic Triangle. This was pretty much the only thing missing from the Liverpool foodie scene, so I am really excited for this and am expecting big things! So definitely add this place to your itinerary when it opens in summer 2017! Read reviews of all the restaurants and cafes above on Tripadvisor. The UK has some pretty good places for a night out, but anyone will tell you that liverpool is one of the best nights out, maybe even THE BEST night out in the UK. But don’t just take my word for it – come see for yourself! Around this area, you’ll find a ton of good bars – so you’re looking at the steers that run parallel to Street, and across it – here’s a little map to help you on your way! My favourites include Berry & Rye, Red Door, Salt Dog Slims, 81 Ltd, Alma de Cuba, Santa Chupitos, El Bandito, Furnival’s Well and Motel. 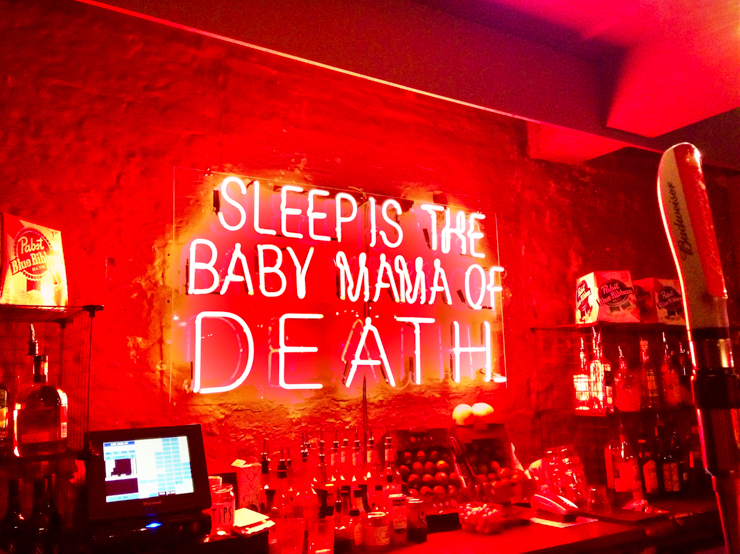 A few of these are speakeasy bars too! 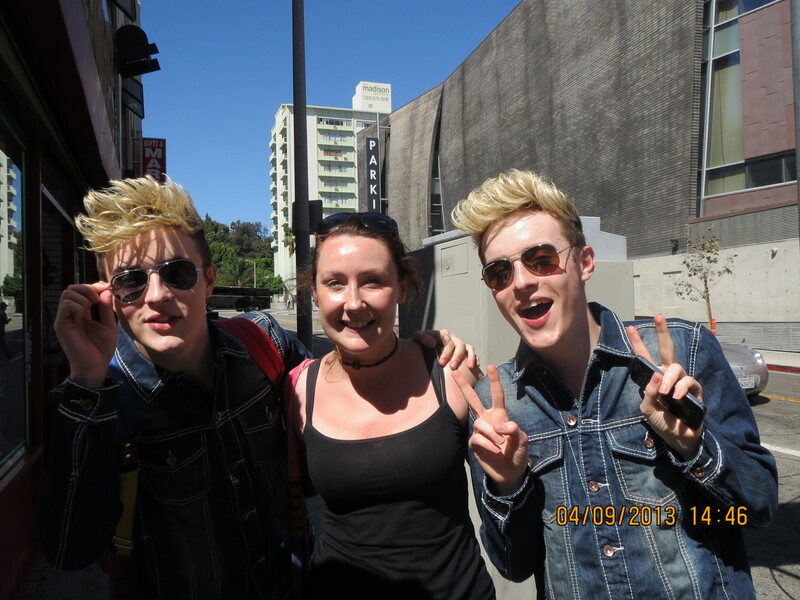 They’re all so close, a bar crawl is pretty easy! Camp & Furnace is probably the best place in all of Liverpool, however I also love Constellations, The Botanical Garden and The Baltic Social. When I was younger, I used to love Mathew Street, but I tend to avoid it now as it does get pretty rowdy, but I’d definitely suggest popping into The Cavern for a drink. However there are a few nice bars around Castle Street like the The Alchemist and The Underground Gin Society. Or if you fancy some champagne, head to the Carpathia Champagne Bar at the 30 James Street Hotel which has an outside terrace where you can watch the sunset over the Liverpool waterfront. Read reviews of all the bars above on Tripadvisor. The main station is Liverpool Lime Street, trains run direct to here from most major stations in the UK and from Manchester Airport. This includes a direct 2,5 hour train ride from London. You can find out the rail time on National Rail. Liverpool also has it’s own airport – John Lennon Airport. The closest train station to the airport is Liverpool South Parkway, which can be reached by bus (take the 500 or the 86A) or taxi/Uber. Trains run direct from here to Liverpool Lime Street and Liverpool Central. Or you can just stay on the bus and they’ll take you into the city centre. For more info on getting to and from the airport, click here. Liverpool is a pretty small city, so walking is the best way to get around, but Uber’s, taxis, buses and the underground stations of Liverpool Central, Lime Street, Moorfield’s and James Street are also options. Liverpool is an amazing city and definitely up there with the best in the world. I love my city and I hope you will too! Come visit us soon! We (the people of Liverpool – I speak for us all) look forward to welcoming you soon! This post was brought to you as a result of the #WelcomeToEngland campaign, created and managed by iAmbassador in partnership with Visit Britain. As always, all opinions are my own. Also a huge thanks to Visit Liverpool for your support. Please Note: A couple of the links in this post are affiliate links, which will earn me a small commission at no extra cost to you. I only recommend places and products I really love and affiliate sales help with the running costs of this site, so thank you for your support! Liverpool looks awesome!! British Music Experience definitely sounds like something I’d be interested in! 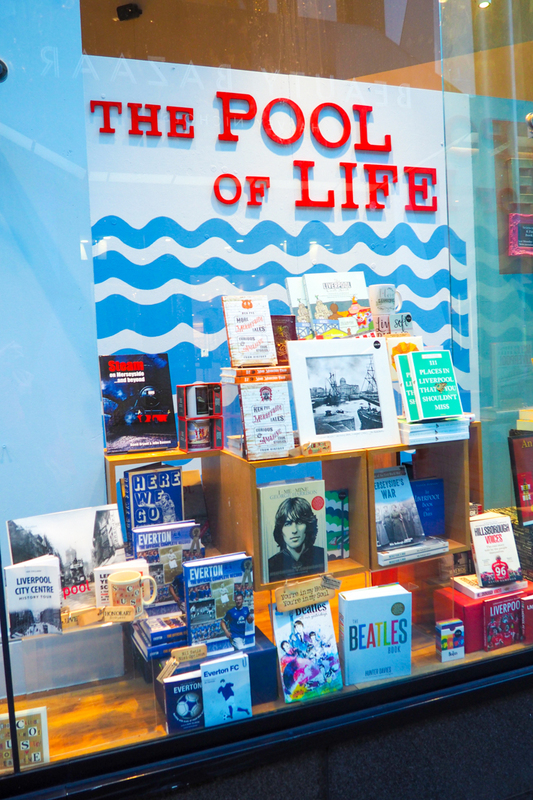 Wow you have packed so much info into this post – a great guide to liverpool! My home city is Manchester but I have visited Liverpool a couple of times a long time ago. I have only been on day trips so l dont feel like I have seen it properly. I recall visiting Albert Docks and a new shopping centre had just opened – is it Liverpool One or something like that!? now I wanna go back to Liverpool so you can show me the city! It looks and sounds so much cooler than I remember! I love Liverpool (even though I’m a Mancunian) and have visited lots of times. You’ve just given me lots of reasons to visit again. Liverpool hasn’t ever been on my radar but since I’m planning a trip to London this year it might be. 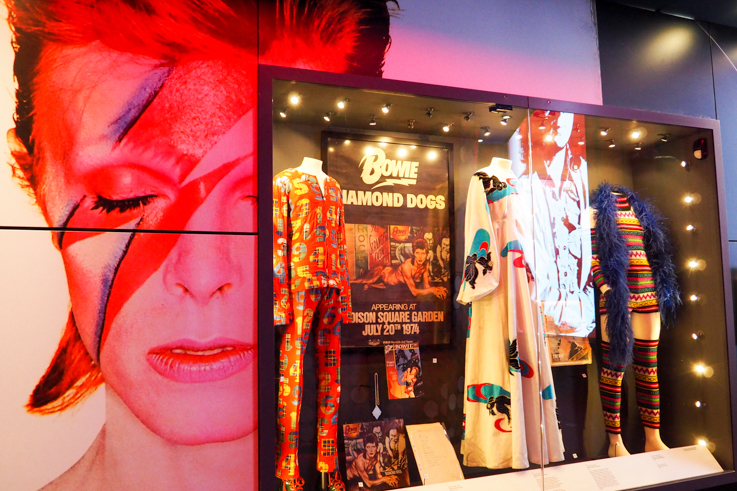 The museums look great including The Beatles Exhibition and the International Slavery Museum. Seems like there’s tons to do and the bar scene looks good! Any favorite restaurants or bars? Thanks again for the post! Yes it’s great! It’s only 2.5 hours from London on the train too, so easy for a weekend trip! This is such a great guide! My mom and I did a lot of these things when we visited two years ago, but the British Music Experience will definitely go on my “next time” list. I also really want to go see the “Iron Men”! 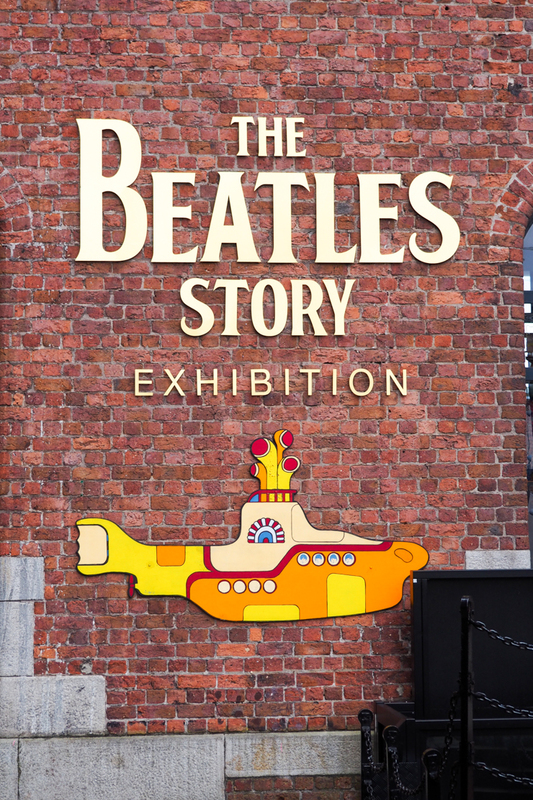 Other must-dos for Beatles fans in Liverpool include the Magical Mystery Tour (it’s kitschy but fun! ), as well as touring the childhood homes of John Lennon and Paul McCartney with the National Trust. 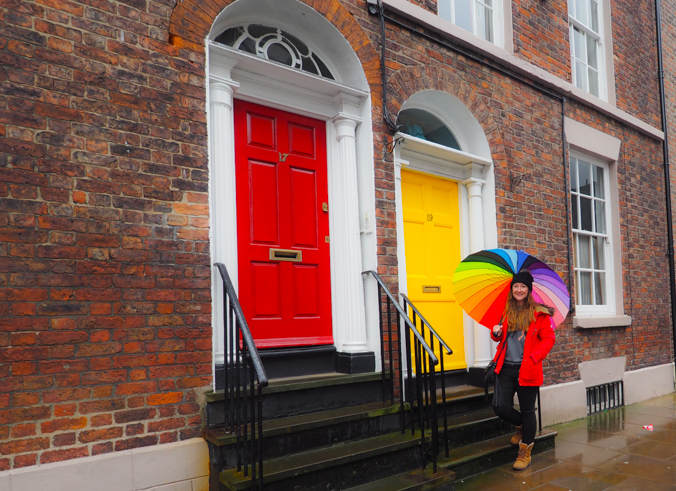 The house tours were my mom’s favorite thing we did in Liverpool! I love the Beatles post on your blog! In fact, I’m gonna link to it in the post! My parents used to go to the original Cavern. 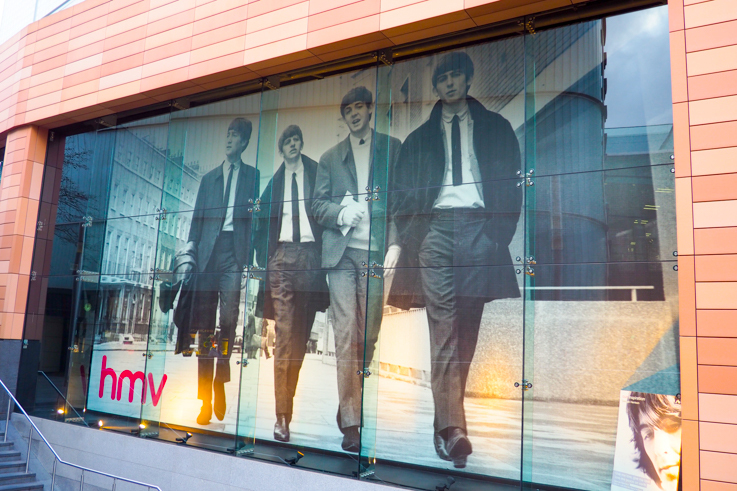 My dad saw the Beatles play – although not in the Cavern. I had so much fun with you and can’t wait to go back!! 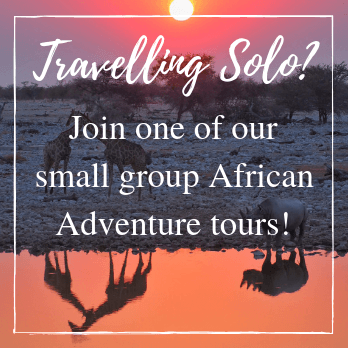 thanks for showing us around – you really made it the best time!! I had so much fun with you too!!!!! 🙂 We need to get that cultural blog exchange going!!! We need to go out dancing again!!! I love how you write Helen, thanks for always sharing, your blog inspires and motivates me to travel. What an amazing experience! I really enjoyed reading your amazing post! I feel another trip to Liverpool coming on! (It’s been a couple of years since I was last there). It’s a cool city!!! 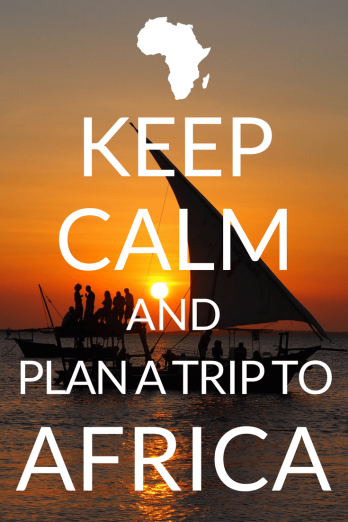 Let me know what you get up to if you do go back! Have fun!!! 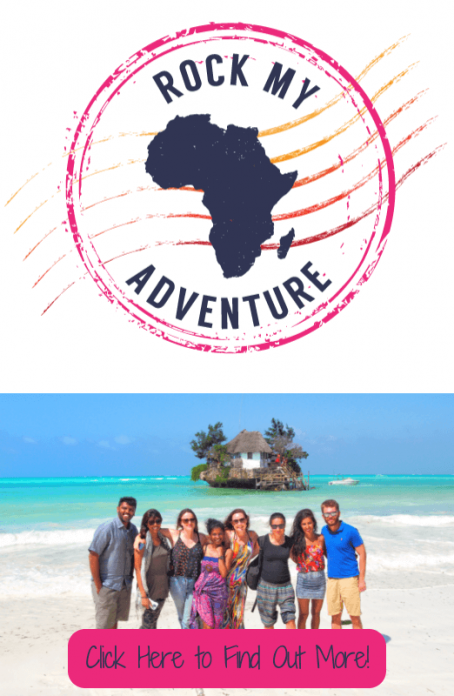 Love this – I’d heard it’s a really cool city but I had no idea how much there is to do! A weekend now doesn’t seem long enough. You can do a lot in a weekend, but it’s never enough!! Try and go on a day when they do Bongo’s Bingo at Camp n Furnace! FUN!! Great list – and this coming from a fellow Liverpudlian! Hi Helen, thanks for the beautiful post. I have been in Liverpool once for a weekend to celebrate my birthday. We were lost a little bit in this city. Wish I had this information then. 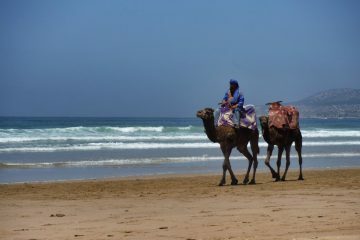 Reason to go back! Thank you!!! Aw yes definitely! Go back and enjoy the city!!! Nice Read. The pictures are stunning and the food looks simply amazing! Thanks for sharing. Such a great post Helen, thank you!! I love Liverpool and I think you did a fab job covering all there is to do!! Would love to read a similar post on Manchester. Liverpool is really a good attraction for tourist, but the way you have you have explored and updated it is really cool. I believe anyone who read this post would love to visit Liverpool. I lived and worked in Liverpool for nearly one year. It was the greatest experience of my life. Dealing with a new life and with the scouse accent was not that easy. Now I got my own travel blog (an italian one) and I’m going to write a great post about Liverpool. I know Andrea (he’s one of the best italian travel blogger) and I hope my post will reach the top of the SERP! Glad to see someone showing off all the highlights of Liverpool, this is a fantastic representation of what our city has to offer, for both locals and people outside the city it shows off just how full of activities Liverpool is. So many possibilities for day trips in the future! If any of our customers are unsure of what to do on their day trips we will be sure you send them over your city guide!